The market is in it's final stages of preparation in anticipation of the opening on Friday, November 25. Join us for the Reception from 3-7pm. The creations of 23 artists will be on display at the Holiday Art and Craft Market beginning Friday, November 25 and visitors are invited to come meet the talented local artisans, painters, designers and photographers during a reception on Friday, November 25 from 3 to 7 pm. Located at 115 South Queen Street, the Market is just across from Main Street’s Santa House, and half a block from the festivities on the town square. Organized by a coalition of three arts organizations (the Berkeley Arts Council, ArtBerkeley and the Heritage Craft Center of the Eastern Panhandle), this is the second year when a wide selection of local work will be available on Queen Street in downtown Martinsburg. Friday’s reception offers an opportunity to talk with the artists and artisans about their work, while enjoying light refreshments. At 5:00 pm, local musician and songwriter Justin Lowans will entertain to add to the party atmosphere. While the Art and Craft Market will be open through December 23, the best selection from the unique items available will come on Opening weekend. Hours for the Market are Wed. and Thurs. from 12 noon to 6 p.m.; Fri. and Sat. from 12 to 8 p.m. and Sun. 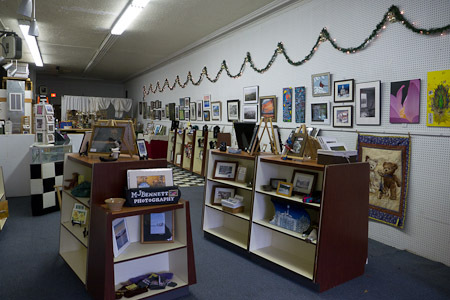 from 12 to 4 p.m.
To learn more about the artists and artisans, visit www.berkeleyartswv.org.